After the critical failure of his portrait of Marie-Antoinette and her children, Wertmüller went two years without a major commission and was "plunged into a deep depression". However, in 1788 he created a new portrait depicting the Queen in hunting dress with an unusual Creole style hat. The image was repainted on a number of occasions, as private gifts. The sources available on the internet imply that Wertmüller acted on his own initiative, perhaps to redeem his earlier failure. However, Wertmüller was close to Madame Campan so the idea could well have originated in Marie-Antoinette's close circle. The copy which once belonged to Madame Campan's family is described by Lenotre as painted "at the request of the Empress of Austria" - though that doesn't quite tie up as Marie-Theresa died in 1780. Apparently Wertmüller did not request another sitting from Marie-Antoinette but just used his existing 1785 portrait and studies. This is the iconic image. According to the notice on the Joconde database the portrait is signed and dated: A.Wertmüller. S. / à Paris 1788. However, the picture is something of a mystery. It was acquired the Château de Versailles only in 1963 and is listed as having been part of the collection of Charles Besnier and that of the marquis d'Argence, sold by public auction in 1963. It would be nice to have a clearer idea of provenance. However, the general presumption is that this comparatively large, high-quality portrait is the "original". This picture in the Kunsthistorisches Museum, Vienna is published in the Bridgeman Art collection and appears on various websites, sometimes attributed to Vigée Le Brun or said to be copied by her. Apart from the title, I can't find any helpful details, such as size - but at a guess it is a small copy. It would be nice to know when it arrived in Vienna. This picture is from a set of old photographs in the Bibliothèque nationale. The description says the original was 16cm x 12cm and formed part of the collection De Fonton in Vienna. It is very similar to the painting now in the Kunsthistorisches Museum and could be the same one, though the frames don't match. 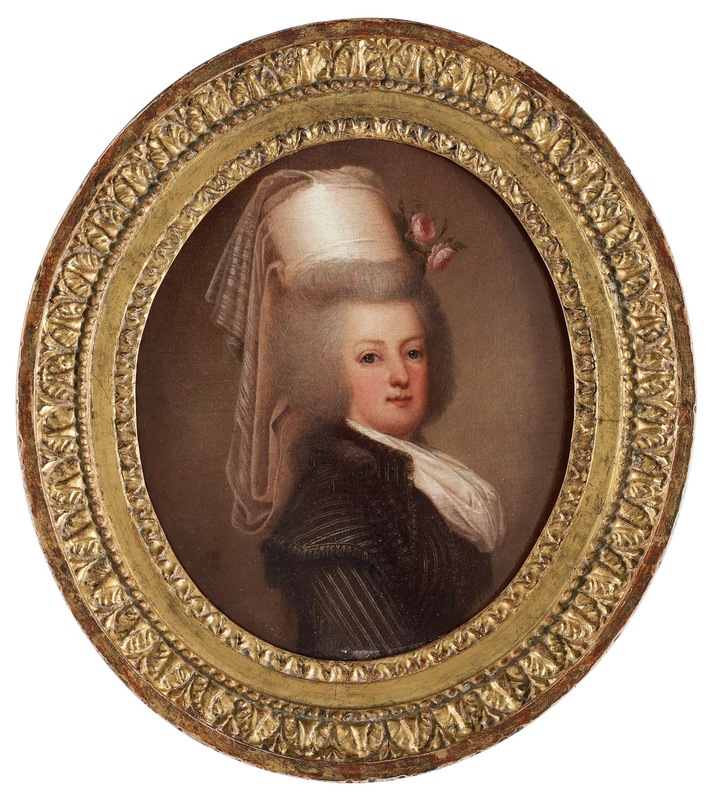 This oval portrait in a very ornate frame, was recently auctioned by Bukowskis in Stockholm and fetched 147,000 SEK - about £11,500 (unless I've got my decimal point in the wrong place!) It is the same small size, 16cm x 13 cm. This example was at first advertised as signed AW and dated 1789, but then the auctioneers changed their minds and decided that the date was 1784. As they point out this would mean it pre-dated the Versailles picture and becomes "the prototype of Wertmüller's well-known image of Marie Antoinette at Versailles". There is a detailed provenance for this picture: it is identified as no.20 in the catalogue for the auction of Wertmüller's studio contents which took place in 1812, the year after his death. It eventually found its way to Sweden. Olivier Blanc mentions "another portrait" in a Swedish collection - perhaps it is this one. According to Olivier Blanc there was a "story" that the costume was altered on certain copies of the painting, notably that in the formerly in the collection of the comtesse de Biron, to render the model “unrecognisable” and to avoid the destruction of the work during the Terror. Blanc is sceptical but there is good evidence this ruse took place. In 1906 to be found "chez Madame Partiot in Paris"
In a footnote on p.11-12, Lenotre gives some more details. 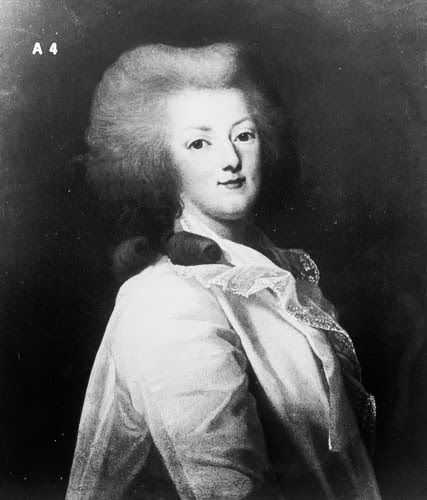 It was to Mme Aughié that Marie-Antoinette gave the portrait, painted at the request of the Empress Marie-Theresa, by the German artist Werthmuller and which features at the front of this volume. 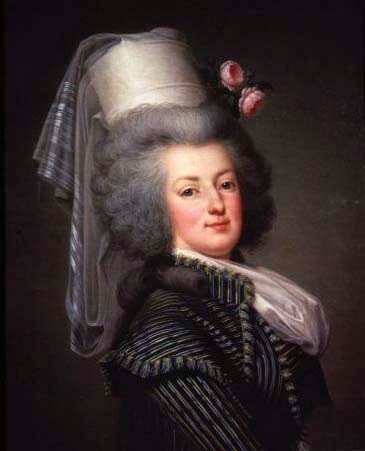 The Queen was depicted in hunting costume, her head covered by a large hat ("feutre") decorated with a rose and with a veil that fell onto the shoulders. 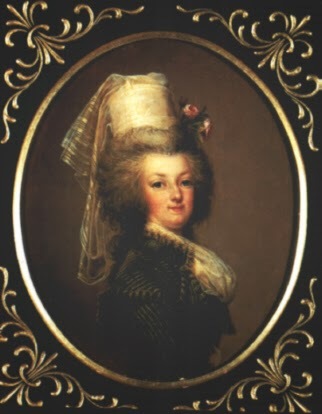 This painting, precious in so many ways, was hidden during the Revolution, and, as an excessive precaution, in order to make it unrecognisable, the hat was replaced by a large wig and the veil was altered into a sort of coat which covered the dress. 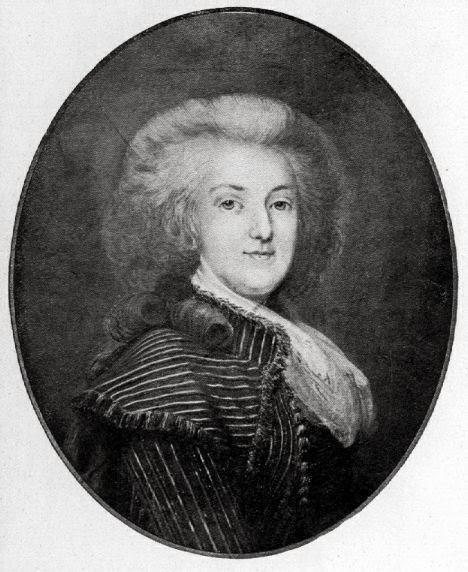 At a later date, Mme Partiot, née de la Ville, the granddaughter of Mme Aughié, rediscovered the portrait. She gave it to Isabey who attempted to remove the overpainting and who succeeded in restoring the costume; but he did not dare to scrape the wig for fear of damaging the face which remained intact and which was painted with great finesse and in marvellous tones. It was in this state that the canvas took its place in the gallery of M. Patriot [ie. the great-grandson of Mme Aughé] who has allowed us to reproduce this unpublished portrait of the Queen. We ask him to accept our sincere expression of gratitude"
by Adolf Ulrik Wertmüller, 1787. 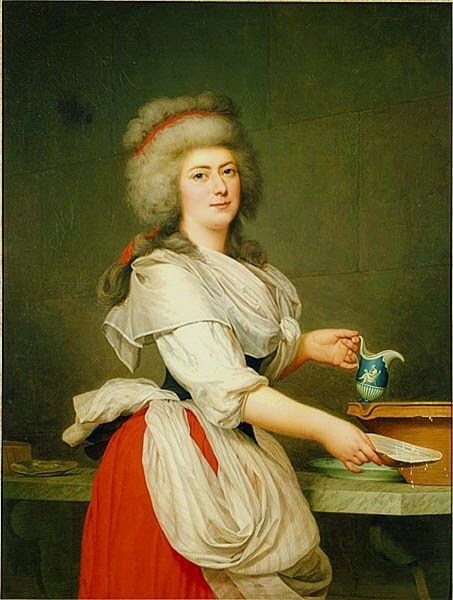 Adélaïde Genet, Madame Auguié, was the sister of Madame Campan and one of the last femmes des chambre of Marie-Antoinette Wertmüller's close relations with the Genet-Campan family are well attested. 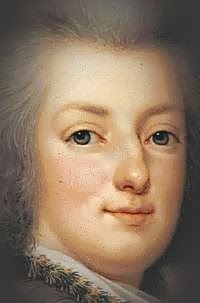 It was Madame Campan who finally secured him payment for the 1785 commission - a mutual friend Gabriel Londblom, governor to Madame Campan's younger brother Edmond Genet acted as their go-between. He came to paint almost a dozen portraits of various family members, including the fine study of Adélaïde Auguié as milkmaid in Marie-Antoinette's dairy at Le Hameau, now in the Nationalmuseum Stockholm. This museum has also recently acquired a portrait of Madame Campan's two-year-old son Henri painted in autumn 1786. In this copy, the coat is intact! It is also pretty clear from the shape of the hair where the highly recognisable Creole-style hat once was. The picture is reproduced on several different internet sites, but the only actual information furnished is that it "was in the possession of the Countess Biron" in 1931. I haven't been able to find the original photograph. The Bibliothèque nationale possesses a photo of a very similar painting, this time annotated as belonging in 1906 to Madame Duplessis in Nice. The photograph is described as 66cm x 55cm, so here again is a full size original. The photos don't look quite identical but it seems surprising that there should be two different pictures overpainted in this way. This intriguing image was posted on the VLB website (though subsequently removed). It was contributed by the artist Angela Demutskiy (who recreates 18th-century portraits) and annotated simply as a "detail from a version with the head straight". It doesn't obviously match any of the examples above, except perhaps the Campan portrait - but I wonder whether the omission of the hair is significant?